You have added Depths of My Heart V Dip Pencil Dress in Blue into shopping cart. Wow! This strapless dress creates the perfect silhouette. This body-hugging dress has a dramatic V-dip neckline which gives off a sultry vibe. The Depths of My Heart V Dip Pencil Dress is a classic figure flattering silhouette that will show off your curves. This dress is lightly lined at bust and unlined through bottom. It is made of a thick cotton blend. A hidden back zipper completes this dress. A date night or a party would be the perfect scene to wear this sultry dress. 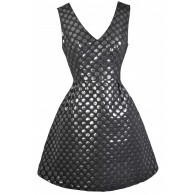 Pair this dress with strappy heels or pumps and some bold earrings and you have completed your sleek look! Details: Lightly lined at bust and unlined through bottom. Hidden back zipper. 65% nylon, 30% cotton, 5% spandex. Lining: 100% polyester. Hand wash. Cold water separately; color will bleed. No bleach. Hang to dry. Small measurements: Length from bust to hemline: 26.5”. Bust: 32”. You have added Depths of My Heart V Dip Pencil Dress in Blue into Wishlist. You have added Depths of My Heart V Dip Pencil Dress in Blue for Stock Notification. You have set Depths of My Heart V Dip Pencil Dress in Blue as a loved product. You have removed Depths of My Heart V Dip Pencil Dress in Blue as a loved product.